The beauty of this pie is that you can use any leftover meat or vegetables you have in the fridge. If you don’t have enough roast potatoes to make the topping, use ready-made puff or shortcrust pastry instead. 1. Preheat the oven to 200˚C, gas mark 6. Melt 30g butter in a large frying pan and gently soften the onions with a pinch of salt for about 10 minutes. Add the sherry, turn up the heat and bubble for a few minutes until just a few spoonfuls of liquid remain. Sprinkle over the flour and stir to mix evenly. Gradually stir in the stock, then the gravy; simmer for 5 minutes until the sauce has thickened slightly. Stir in the meat, mustard, bread sauce and cooked vegetables (but not the sprouts or potatoes); season. Pour into a 1.5-1.8 litre pie dish. 2. 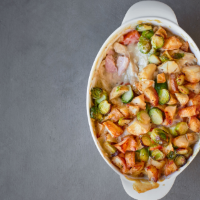 In a large bowl, mix together the roast potatoes and cooked sprouts, adding a splash of milk to coat; season. Allow the pie filling to cool a little then top with the potato mixture. Dot with the remaining 10g butter. Bake for 35-40 minutes, until the pie is golden on top and the sauce is bubbling. If the sprouts start to char too quickly, cover the pie with foil.